greeting to my dear steemit mates!! Today for cook with us week 16 I have decided to go with Korean flavours for the pizza week. This inspiration just popped out of my mind when I has having lunch with my friends. All along I was planing to make a Asian inspired pizza but I did not know which part of Asia to borrow it's flavour until I had that Korean lunch. 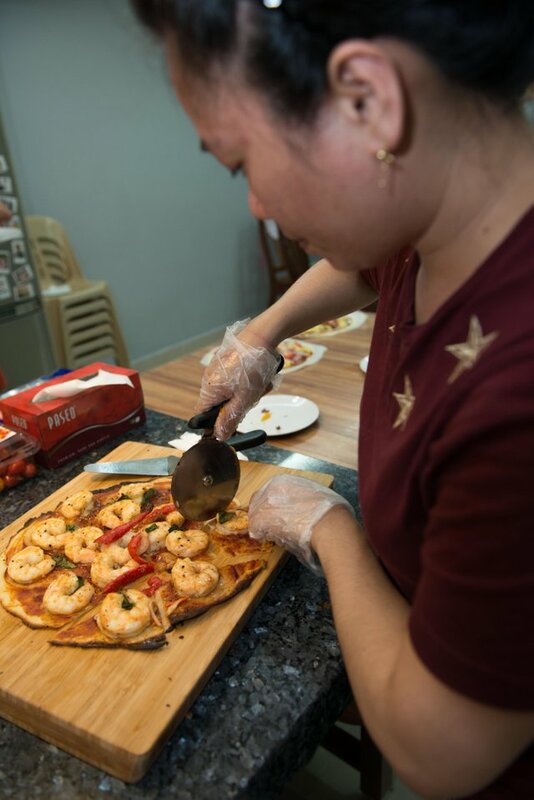 The reason I picked Asian flavour is mostly because I'm much more familiar with it, plus it's just another way to make the typical pizza more interesting and exciting. 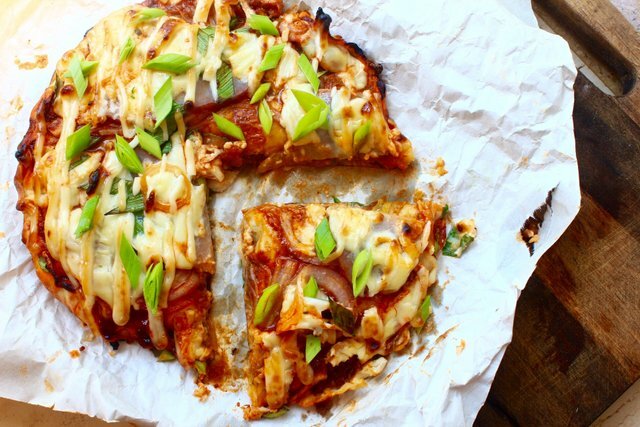 Pizza is amazing as it is but I though that it could be more amazing if I could add more meaty ingredients in it. The challenge of doing that is that if there is too many topping, the topping will just fall over when the slice is picked up. In order to overcome that issue, I have stuffed the pizza with the ingredients. 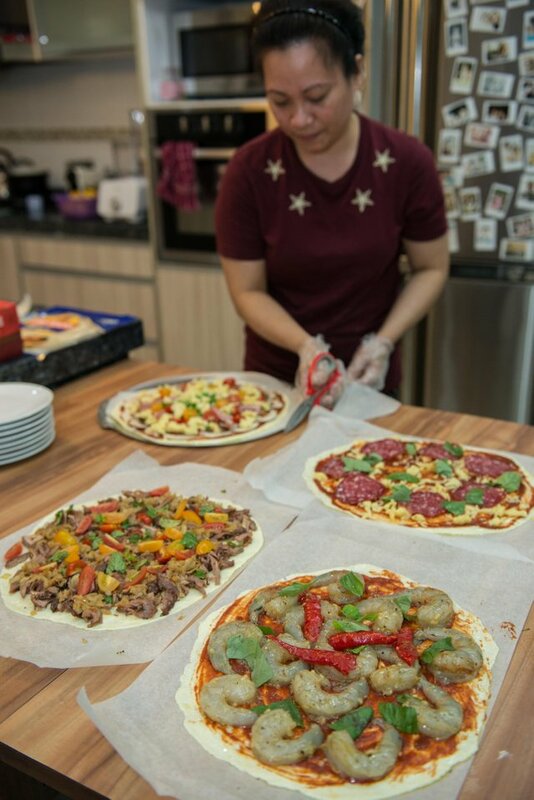 To this pizza there is five main ingredients which are my homemade bacon, homemade kimchi, minced meat bulgogi, homemade kimchi sauce and homemade sesame oil mayonnaise. I'll be describing it in detail below. Kimchi for those who are not familiar with it, it's technically fermented vegetable. This is one of the most common appetiser found in every Korean meals. It can be use to cook many dish such as kimchi fried rice, kimchi stew, kimchi stir fried chicken. For me I know it will would work well in a pizza because it gives a juicy crunch, spicyness, slight hind of sweetness and saltiness. Beside being delicious it's also extremely healthy. 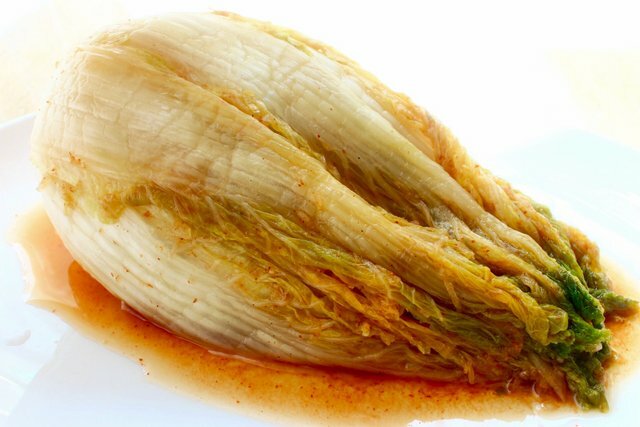 To make the kimchi, any vegetable could be used by I stayed traditional by using Napa cabbage. 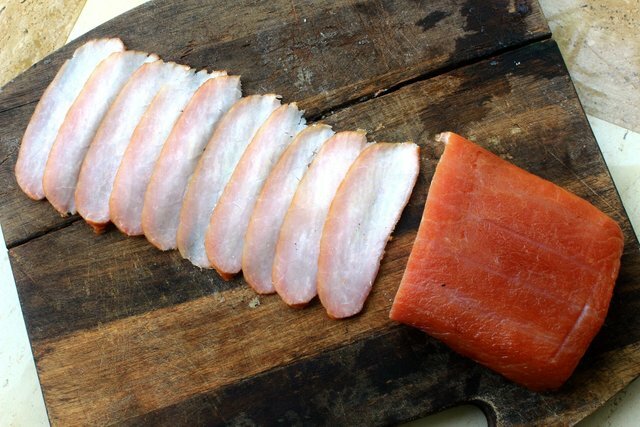 I salted each layer of leaf with seasalt and let it sit for 2 hours. A pool of water should be found at the bottom, that water is not used. Squeeze the cabbage to remove more liquid and then massage each leaf with the hot paste mix. The hot paste mix is made from grated ginger, grated garlic, daikon radish, chile powder, honey, salt and seafood broth. I let it ferment for 3 days before using it. The reminding kimchi is store in the refrigerator. 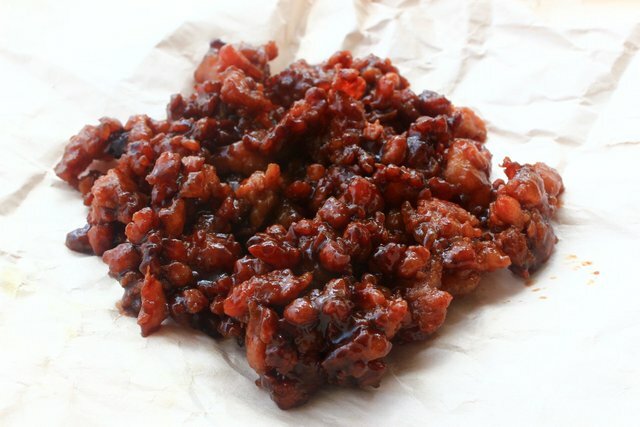 Bulgogi is what westerner called barbercue meat with the sweet barbercue sauce. This elements will add meaty flavours as well as giving the dish a good meaty texture, sweetness and saltiness. To make the minced meat bulgogi we have to first miced the chosen meat. In this case I have picked pork shoulder as it has the correct amount of fat to meat ratio. Next is to marinade the minced meat in soy sauce, sesame oil, honey, and sodium nitrate just to give the meat a little cured flavour. Bulgogi is traditionally grilled with charcoal but I have took a different approach which is by pan frying it as its more practical. I pan fried it until it's nicely chared at some parts and caramelize at the rest. I let it cool before filling it in the pizza. Now this should be something everyone should be familiar with, thus I guess no intro in needed. This will give the dish alittle more character, the smoky flavour will enhance all the traditional Korean flavour. The bacon took me about a week to be made. 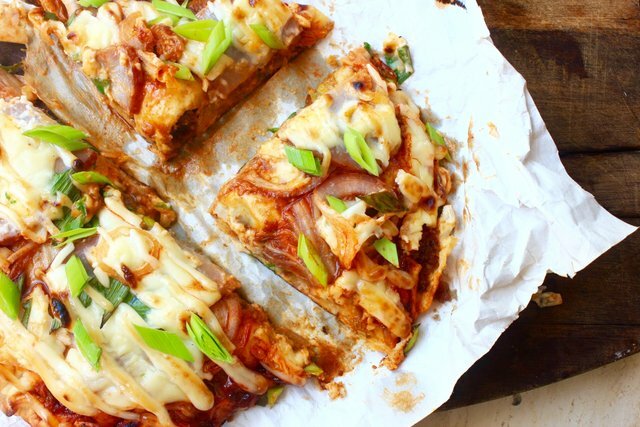 For this dish I have used pork loin instead of pork belly mainly because I prefer the bit of lean meat and also I didn't want to add more fat to the pizza as it already contains a lot of fat from the cheese and the mayonnaise. I cured the bacon in sugar, salt and sodium nitrate for about 6days before soaking it in water to remove excess salt. After that I dried the exterior to form the pellicle which is nessary for the smoky chemical compounds of the wood chips to adhere to. The whole soaking and drying process took me 2 hours each. Finally I smoked the meat outside with hickory wood chunks controlling its temperature at 80c for 3 hours or until the bacon reached 65 c. Let it cool and it's ready to be used. This sauce will be replacing the traditional tomato sauce in Italian pizza. The sauce is sweet, salty, packed full of chile flavour and flavour of the fermented cabbage flavour and most importantly a spicy kick from the chile paste. 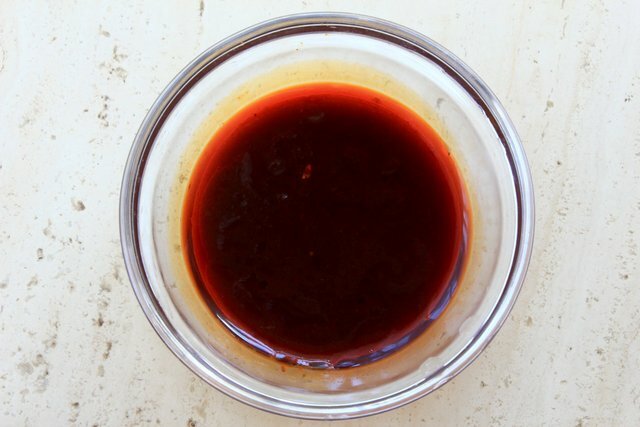 The sauce consist of juice from the kimchi brine, spicy bean paste, soy sauce and sugar. The plain mayonnaise is good enough but because I wanted to bring more Korean flavour to the pizza I decided to use some sesame oil take the mayonnaise. To make the sesame oil mayonnaise, I first whisk the egg yolk with soy lecithin and then slowly dizzle a mixture of sesame oil and vegetable oil making sure the mayonnaise does not split. 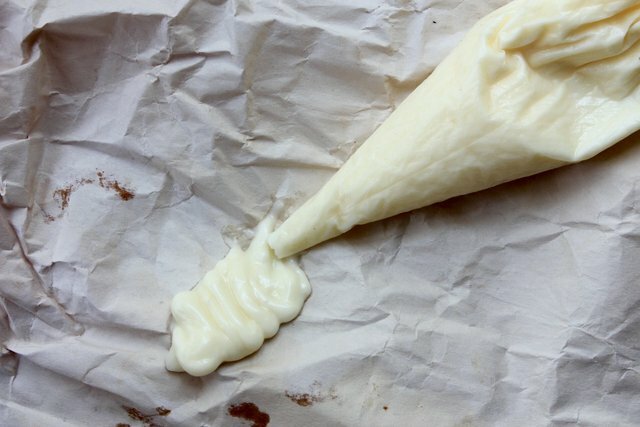 You know it's done when the mayonnaise is to your desire thickness. These are common ingredients but I still feel like it contributes to the dish is whole therefore they deserve some recognition. 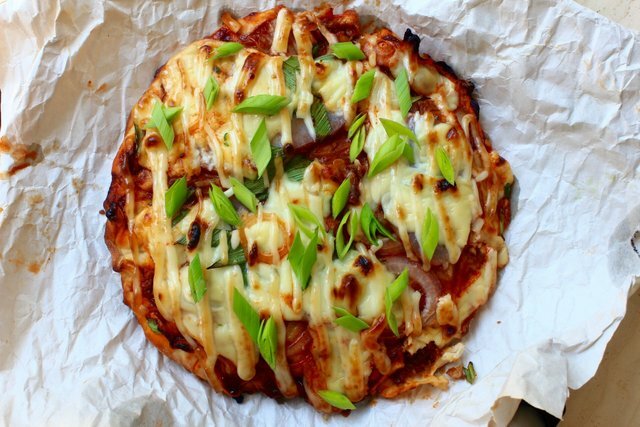 The ingredients are : sliced red onions, mozzarella cheese, and leeks. Mix all the dried ingredients well before mixing in the milk. Add the milk bit by bit as its easier to work with. Once a dough is from, kneed the dough until its stretchy and elastic. A way to check the to pull is stretching the dough, with the help of the sun see if any light can pass though the dough of not, if lights are observed then it's ready. Let the dough rest for 60 minutes before knocking down the air in it to evenly distribute the air pockets. Shape it into 2 balls and let it raise ones more. With a rolling pin roll it into a flat circle and it's ready to be topped. 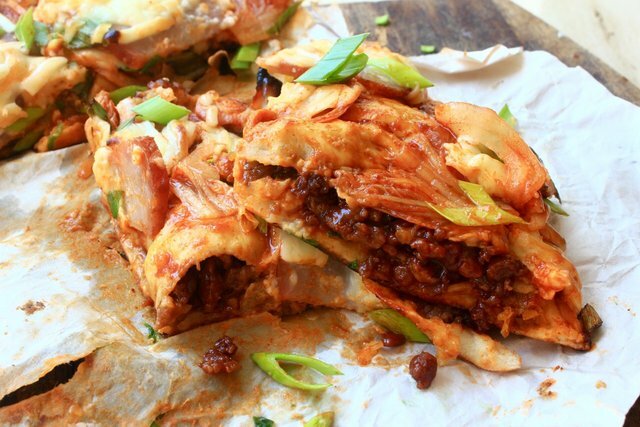 With one flatten dough, I layered a layer of mozzarella cheese and a layer of the minced meat bulgogi. With the other layer of dough, gently place it on top of the first dough and seal the edge to make it into one. With a preheated cast iron pan, place the pizza on it for about 1 and 1/2 minutes or until the bottom have areas of char. Transfer to a 230c oven on a upper heat setting to cook the top of the pizza. It took me about 3 minutes, you should know it's done when the cheese has melted and the mayonnaise and cheese is slightly browned and chared at some parts. Finish it with some sliced young leeks. I got excited by just seeing the meat in the middle fall out!! Yum! I can't believe you made your own bacon!!! That is amazing. I just wish I could taste your master piece in person. Bacon is easy to make especially if you got the know how and patience. I bet u can recreate a dish to taste just like mines. Thanks for all ur support! Holly Molly !! 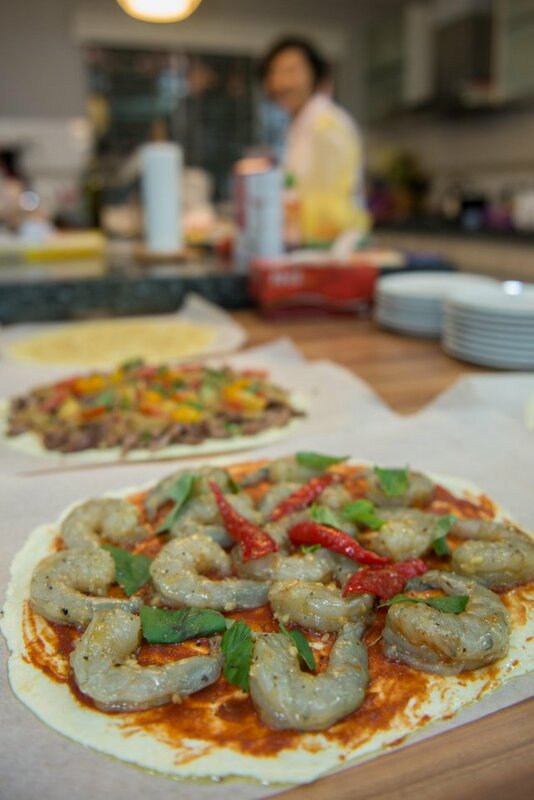 That's some delicious looking huge prawn pizza!! Thanks for compliment. Well done on getting a vote from @curie - @alansthoughs - amazing that you made all these ingredients and even home made bacon - well done !!! Thanks @pandamama, it's satisfying to make my own ingredients! This post has been upvoted and picked by Daily Picked #53! Thank you for the cool and quality content. Keep going! You can upvote, follow, resteem, delegate and join my curation trail to support me, good creators and minnows. Korean pizza ... nice! I love the variation you put into your pizza. Plus, I'm impressed that you made your own bacon and kimchi. I bet the pizza tasted heavenly. My favorites are the sesame mayo and the spiciness of the pizza. I make mayo but haven't tried making sesame mayo. I should and I will. You have inspired me. It must be a game changer. Hahaha thank@offoodandart, preserved and fermented food are my favourite food to make. And yes the sesame oil Mayo really do make the dish more Asian. Raw food week eh, I'll see if anything comes into my mind. Very cool @alansthoughs! This pizza is an umami bomb! It reminds me of a cross between Italian pizza and okonomiyaki. I'm loving your creative interpretation of pizza. Thanks for the compliment @chefsteve, that's why I love pizza, there is so many variables!! It's suitable for anyone.